DIRECT FROM LOURDES - Lourdes DVD of Bernadette and the Story of her Apparitions, DVD Pal only. Lourdes DVD of Bernadette and the Story of her Apparitions, DVD Pal only. 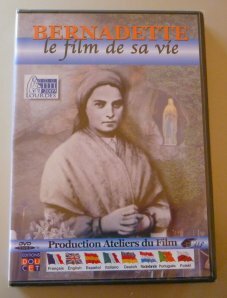 DVD film of Bernadette, following Saint Bernadette from her birth in Lourdes to her death in Nevers. A life of poverty, prayer, penance, but also joy, happiness and innocence.